Should you choose a foam mattress, a spring mattress or a natural fibre mattress? Just like adult mattresses, you have a choice between purchasing a foam, spring or fibre mattress. We make each and every mattress by hand and with care. Our foam is specifically designed for use of babies and young children; it’s classified as CMHR25 foam and is fully breathable and hypo-allergenic. This inner contains no arsenic, phosphorus or antimony. Coil sprung unit surrounded by an inch of hypo-allergenic foam and a layer of polyester wadding, this mattress is firm and offers plenty of support. 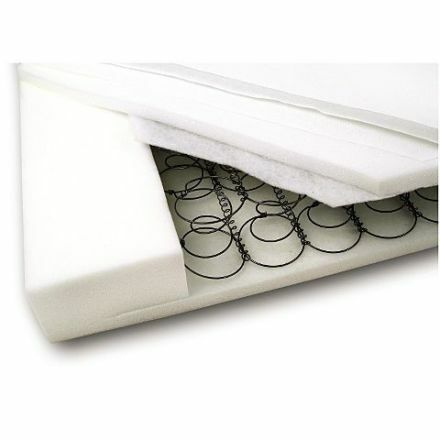 Our sprung mattresses are breathable. This inner contains no arsenic, phosphorus or antimony. Natural coconut husk pad surrounded by pure new wool wadding. The coconut has a complex layered design which means it has fantastic breathability and also the latex used to bond the coir fibres is naturally hypo-allergenic. The wool is a very soft, natural and ‘snuggly’ alternative to polyester wadding. This inner contains no arsenic, phosphorus or antimony. A traditional coil sprung unit surrounded by coconut fibres which are then covered in pure new wool wadding. The coconut has a complex layered design which means it has fantastic breathability and also the latex used to bond the coir fibres is naturally hypo-allergenic. The wool is a very soft, natural and ‘snuggly’ alternative to polyester wadding. This inner contains no arsenic, phosphorus or antimony. Individual pocketed springs surrounded by coconut fibres which are then covered in pure new wool wadding. The coconut has a complex layered design which means it has fantastic breathability and also the latex used to bond the coir fibres is naturally hypo-allergenic. The wool is a very soft, natural and ‘snuggly’ alternative to polyester wadding. This inner contains no arsenic, phosphorus or antimony. Individual pocketed springs designed to distribute weight evenly, offering better support and the ultimate comfort for your little one. This inner contains no arsenic, phosphorus or antimony. When choosing a mattress, be sure it fits snugly on the bed. All of our mattresses are fire retardant and pass stringent British Standards. Family and friends like to hand their furniture down, which is fine, however many second-hand, older mattresses may not be fire retardant. They may also be worn out and won't give the support needed, even though they may look good on the outside. These are probably the best reasons for purchasing a new mattress for your child. All our mattresses comply with the rigorous requirements of BS 1877 Part 10 for safety and performance and BS 7177 for flammability, without the use of nasty chemicals such as arsenic, lead, barium, antimony or phosphorous.